Ederney bridged a 12 year gap since their last senior final appearance with a 3-13 to 3-5 win over Erne Gaels. Now they are looking to bridge and even longer gap, back to 1968 and the club’s one and only senior title. The St Joseph’s men looked well in control at the break last Saturday in Brewster Park, but a two goal blast from Belleek had them reeling midway through the second half. They steadied the ship though and had eight points to spare as they booked a place in the decider against three-in-a-row champions, Derrygonnelly. “We were looking to get back to one for the first time in 12 years, but we made hard work of it,” said Ederney manager Mickey Cassidy. “We were in control of that game in the first half and let Belleek back into it. “Themselves and Derrygonnelly were the top two teams in the county and they have some strong players. Ultan Kelm, Ryan Lyons, Tommy McCaffrey, they’d be on any other team. “But we took the foot off the gas after half-time. Yes, we knew they were going to come with a big push, but when we came out after half-time we were still in control of the game, we scored the first point and then we were turned over and that started it. 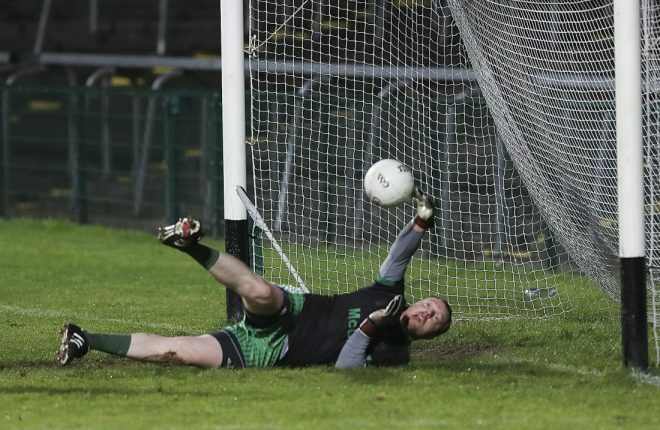 Once Belleek had one goal their tails were up. Despite Ederney being warmly fancied ahead of the semi-final, Cassidy says he was careful to ensure his charges were in the right headspace ahead of the match. “The boys attitude going into the game was very good. We weren’t at the game [Derrygonnelly v Devenish]. We had a light training session. I didn’t want any players sitting looking at that, because we were just thinking about Belleek. We didn’t look past them at all because that’s one of the most dangerous things you can do. That said Cassidy acknowledges that Ederney have come a long way in recent years themselves. They won’t be turning up in Brewster Park at the end of the months to make up the numbers. There’s an great few weeks in store around St Joseph’s Park now, not an experience many Ederney teams have had the opportunity to savour. An experience Cassidy is looking forward too?